We’re officially into the holiday party season! Stacey and I kicked it off with a Letters to Santa party this weekend. If you follow us on Twitter or Instagram you’ve had a sneak peek. If not, you’ll be able to see and and read all about it this week and why aren’t you following us yet? We have a lot of great things heading your way this week so make sure to follow by email or RSS feed so you don’t miss out. At the holidays there seem to be more potlucks and I definitely get more requests for appetizer recipes from friends during this time of year. In my family, we eat appetizers Christmas Eve for dinner. It started years ago because we have such a huge dinner the next day and it has continued ever since. I love it! You can get such a variety of tastes without having to gorge on the food. (Not that I don’t anyway!) 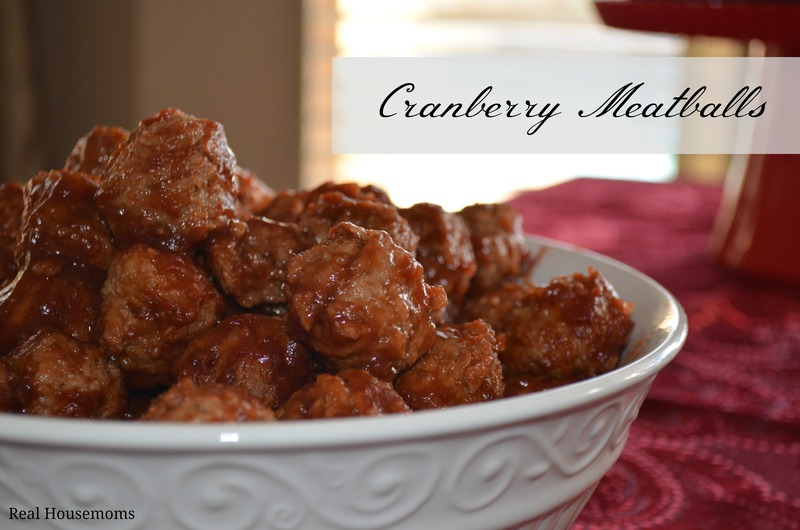 These Cranberry Meatballs are a big hit and couldn’t be any easier! Give them a try this year and your family will be thanking you. This appetizer is so fast and easy, you won't believe how amazing it tastes! They are perfect for any party. In the crock pot whisk the cranberry sauce and chili sauce together. pour in meatballs and cook on high until warm, then reduce to warm setting. We always have appetizers on Christmas Eve, too! We did it in my family when I was growing up and I carried it over to my family. We love it. And I love the idea of these meatballs. SO easy and they sound delicious. One question, what type of chili sauce do you use? Could recommend a brand or give an example? Thanks! Can’t wait to try them! They really are good. I just used the store brand chili sauce this time but Heinz is the brand I usually use. I didn’t taste a difference. It is right next to the ketchup in the grocery store. I make them for our museum potluck every year -so easy & so good. I use Heinz. A classic party favorite of ours!